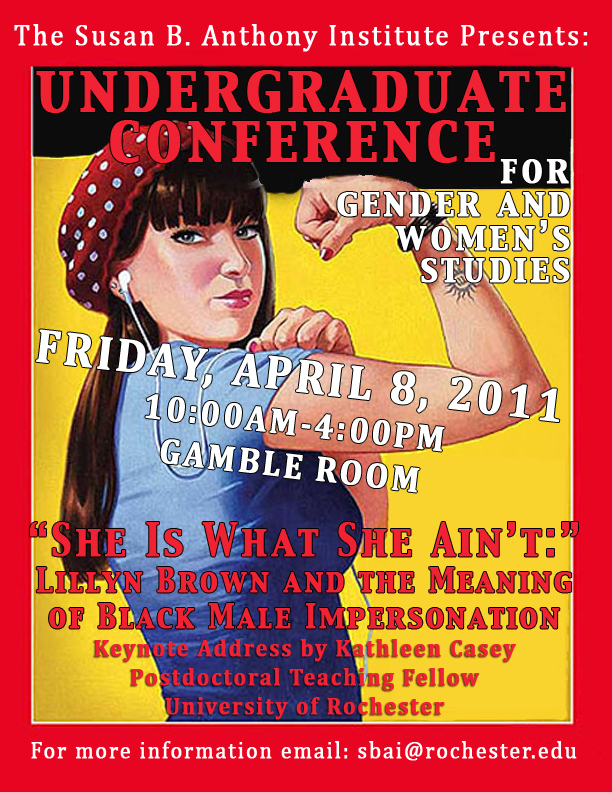 Now that our 18th Annual Gender and Women’s Studies Interdisciplinary Graduate Conference has come and gone, it’s time to look forward to our Undergraduate Conference for Gender and Women’s Studies, taking place next Friday, April 8th. The Conference will feature presentations from University of Rochester undergraduates and a Keynote speech by Kathleen Casey, UR Postdoctoral Teaching Fellow. Casey’s talk is titled “She Is What She Ain’t:” Lillyn Brown and the Meaning of Black Male Impersonation and is included in LGBTQI Awareness Month events. The Conference will be held in the Gamble Room of Rush Rhees Library from 10:00am-4:00pm. This entry was posted in SBAI Events and tagged #research. Bookmark the permalink.